New York, Feb 14 (IANS) The US dollar gained strength as market participants digested a slew of key inflation data. 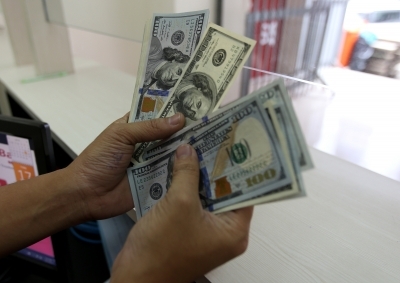 In late New York trading on Wednesday, the euro decreased to $1.1269 from $1.1331 in the previous session, and the British pound was down to $1.2850 from $1.2897 in the previous session, Xinhua news agency reported. The Australian dollar fell to $0.7094 from $0.7098. The US dollar bought 110.99 Japanese yen, higher than 110.50 Japanese yen of the previous session. The US dollar rose to 1.0088 Swiss francs from 1.0062 Swiss francs, and it was up to 1.3250 Canadian dollars from 1.3241 Canadian dollars. The dollar index, which measures the greenback against six major peers, rose 0.43 per cent at 97.1309 in late trading. The Consumer Price Index (CPI) in the US was flat in January due to lower energy prices, the US Bureau of Labor Statistics said on Wednesday. The CPI, a measurement of inflation, remained unchanged for a third straight month in January, after its reading spiked 0.3 per cent in October. Over the past 12 months, the CPI rose 1.6 per cent, slowing down from December's 1.9 per cent year-on-year increase, according to the report. The so-called core CPI, which excludes energy and food costs, edged up 0.2 per cent in January compared with the previous month. Over the year, the core CPI increased 2.2 per cent, the report showed. The data helped create an environment supportive of the US Federal Reserve's current dovish stance, underpinning market sentiment, experts noted.